I had a daughter by my first wife. I then became a widower before my fortyfourth year. Many friends and acquaintances were pressing me to get married, e.g. 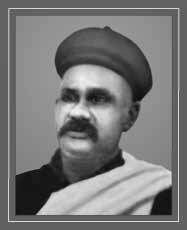 Mr. Barve, Mamlatdar of Kopargaon. I was declining to take the extraordinary step of marrying at about fifty, though I was no doubt anxious to have a son to continue my line. But what guarantee or probability was there of one getting a son so late in life? So I told my importunate friends that I would wed if, and only if, a great a Saint should so advise me. On or about April 1904 I went with Mr. Barve to see Sai Baba at the Mosque. Then after a short time, I took leave of Baba and had got down the steps of the Mosque. Then Mr. Barve told Baba, "Saheb (that is how Baba called me or referred to me always) has no son". Then Baba replied:- "If he marries then God will give him a son". I heard these words myself and Barve and others began to press me again to marry. But the question of the choice of a bride would take time. I went back to Ahmednagar which was then my head-quarters. About the end of that year, I learnt that an able astrologer had arrived at Poona. I consulted that man and found that his reading of the facts about my past and my daughter's past were really correct. He said that my horoscope showed that I was to have male progeny after my fiftieth year. That further strengthened my idea of marrying. In a few months, I was transferred to Ahmedabad. When I was there, Dada Kelkar (i.e.,Ganesh Damodar Kelkar) wrote to me that he had a daughter of marriageble age and wanted to know if a bridegroom could be found there. As none could be found there, perhaps the writer of the letter might have sent it as a feeler to sound my views and see if I would offer myself as the bridegroom. I thought that the letter might be prompted by Sai Baba's unseen influence and I wrote to D.K. that no bridegroom could be found or expected at that distant place and that if he meant the offer to be for myself he should consider my age, my prospects etc. He wrote that he had considered the pros and cons and would be glad to have me for his son-in-law. Then I wrote to him that in that case, he should take the girl with him from his village and go to Shirdi and request Baba to say if he approved of the match as unless Baba approved of the choice, I would not marry her. D.K. was then hostile to Baba in his views and suggested other alternatives, viz: consulting a Brahmin Saint at Wye (who was his brother-in-law); he was afraid that Baba might not approve of the proposal of my marriage with his daughter and it would have to be dropped. But I insisted that he should go and find if Baba approved. So, after all D.K. had to go to Shirdi with his girl and await with Madhav Rao's aid Baba's orders. When D.K. went to Baba, Baba at once told him, "Send the girl to Ahmedabad" ie., to me. Baba's approval was communicated to me and then I married D.K's daughter in 1905 ie. in my fiftieth year. I have a son and some daughters by that marriage.